Hair’s own keratin is damaged through chemical and colour processing. 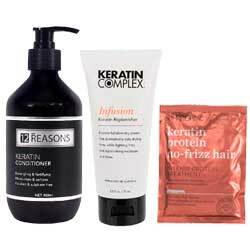 Hair care products containing keratin help rebuild and strengthen so hair shines with vitality. Elasticity of hair is restored and manageability enhanced. Fight frizz and protect against humidity with our selection of shampoos, conditioners, treatments, styling products and much more with the added benefits of keratin. Try keratin for yourself and experience the difference.